There was an added bonus in meeting Laurel and Eric of Raven and Chickadee. Since they had spent so much time in northwestern Florida and have family there, they know the area very well. 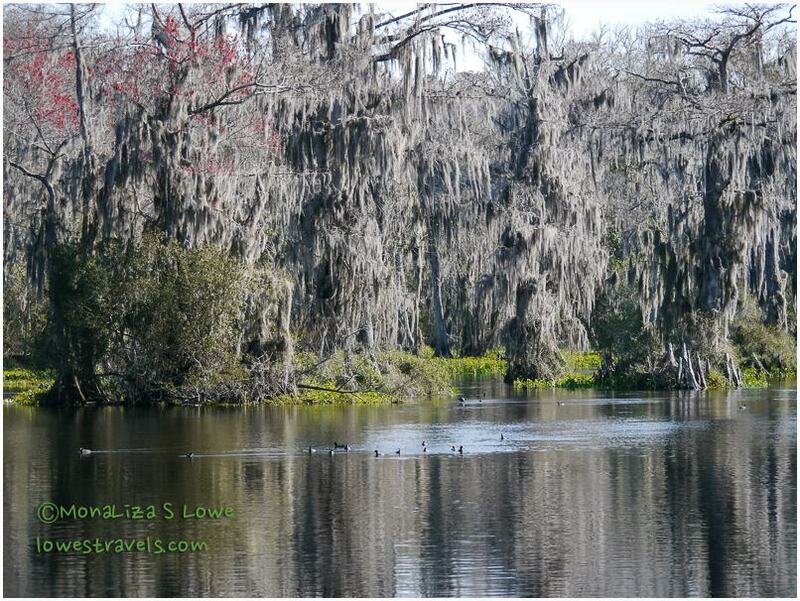 They advised us that a trip to Wakulla Springs State Park for one of their river boat tours was not to be missed. Wakulla springs is located just south of Tallahassee and is one of the largest and deepest freshwater springs in the world. The world? Yep, thats right. We learned that this spring discharges an average of 260 million gallons of beautiful, fresh water every day. Wakulla Spring – Some of the old Tarzan episodes were filmed here. Today, the abundance of wildlife are fortunate to enjoy the beauty of the area. Florida has the largest concentration of freshwater springs on earth more than 600 in all. Most of the springs are found in north and north-central Florida. Water coming from the springs flows through the Aquifer and is the source of over 90% of the state’s drinking water. 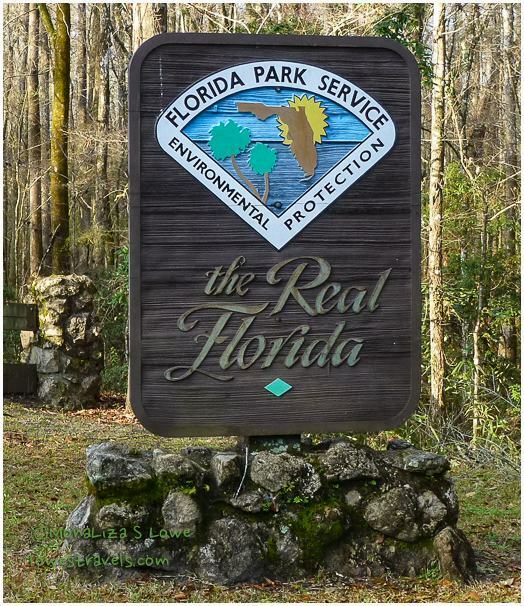 With no rain in the forecast for the next few days, we scheduled our continuing exploration of the “Real Florida”. 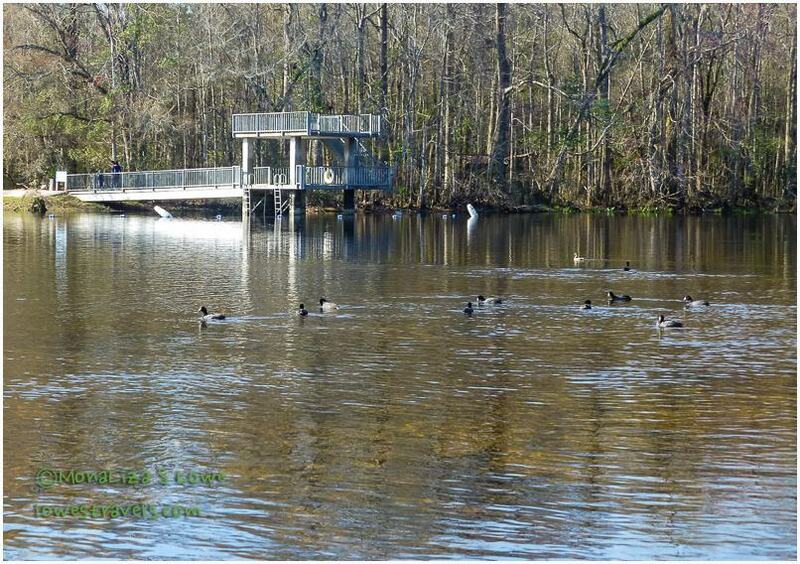 The spring is the heart of Wakulla Springs State Park. It is the origin of the Wakulla River, which flows southwest and finally dumps into the Gulf of Mexico at Apalachee Bay. We came here for the main attraction of the river tour, but the park itself is beautiful with many picnic tables and walking paths that make it a great place to spend a day. After paying the $8 per person fee, we took the first ranger-guided boat tour at 9:00am. 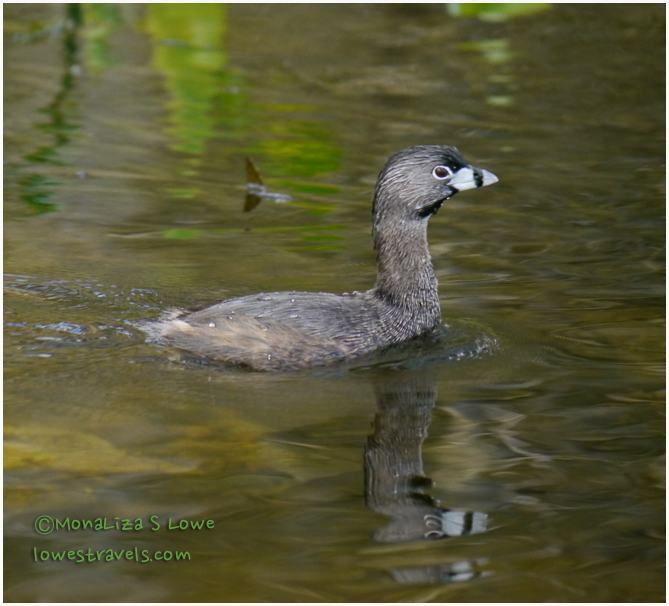 For 45 minutes we were treated to close-up sightings of what we have recently grown to appreciate and love, classic Florida river scenery and wildlife. 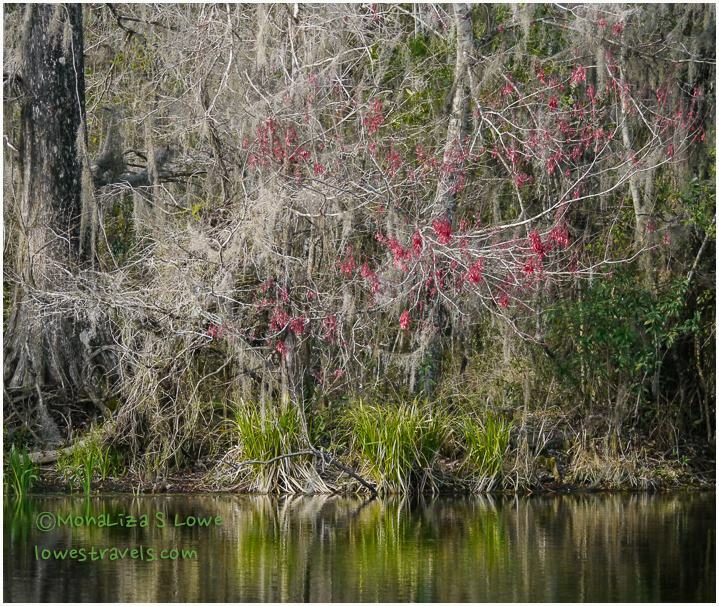 Unlike other rivers we have traveled, Wakulla River is bordered by tall Spanish Moss-draped Bald Cypress trees. 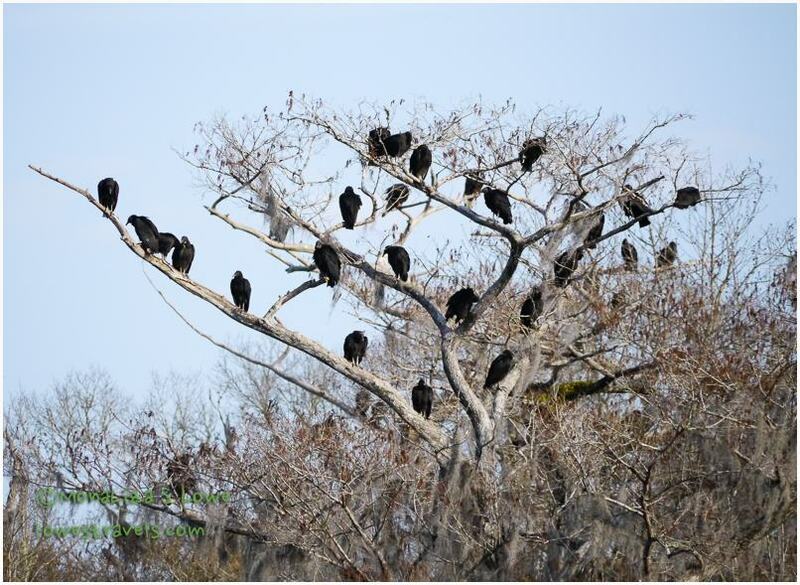 Seeing vultures hanging out in the treetops induced a kind of “haunted house” feeling, like something you might see in an old horror movie. 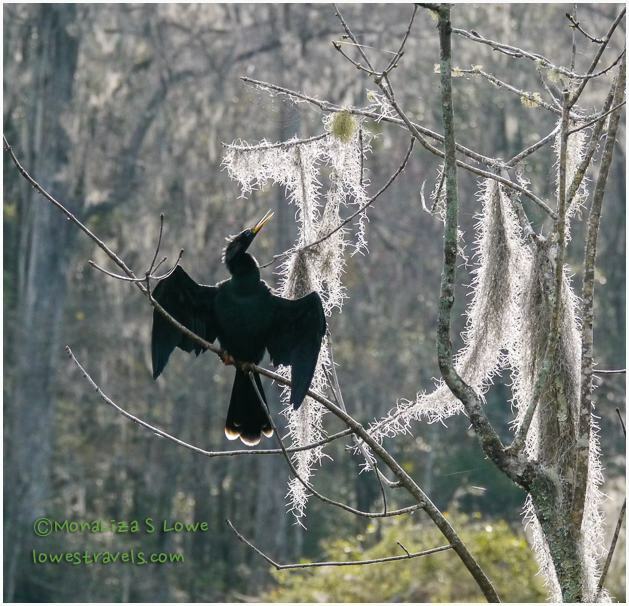 The tour covers the first three miles of the river, which is protected as a wildlife sanctuary within the Wakulla Springs State Park. Female Hooded Mergansers, no doubt rushing off to the beauty salon. One of the areas where Tarzan swung through the trees. Pristine and gorgeous! There was an abundance of wildlife that our knowledgeable park ranger pointed out to us. She told us that since only the park’s tour boats are allowed here, the wildlife has become accustomed to them. That’s why we were ignored and got such an up-close look at them. 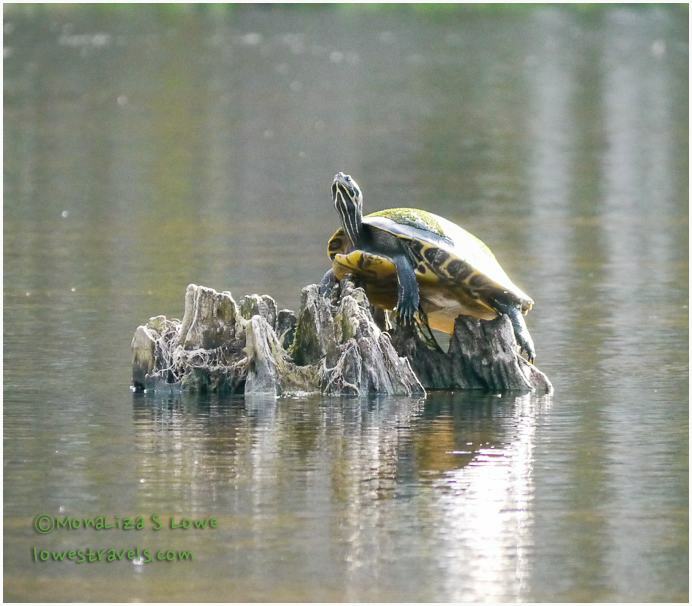 Even the normally skittish turtles didn’t jump into the river as we passed! 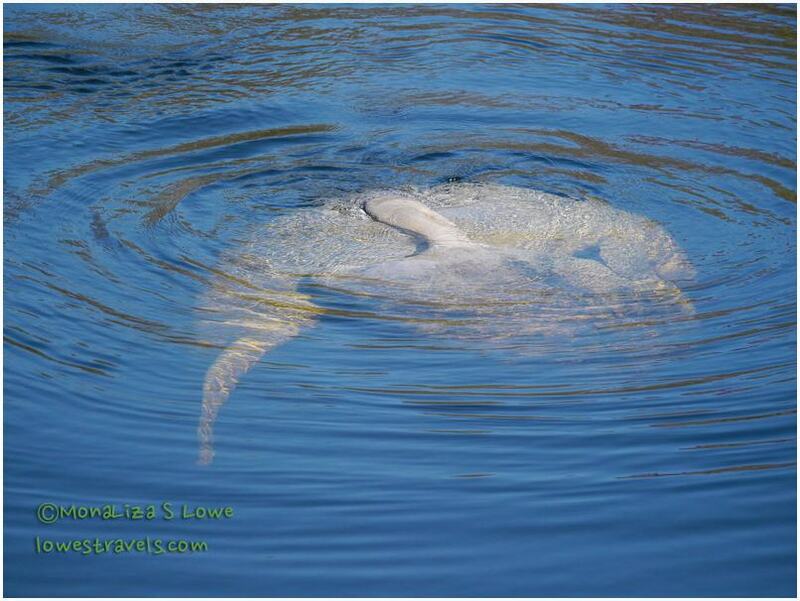 But the highlight on this day was witnessing some tender moments between a couple of manatees. We have typically seen them just slowly cruising along, occasionally coming up for a gulp of air. A happy manatee acting like an otter. 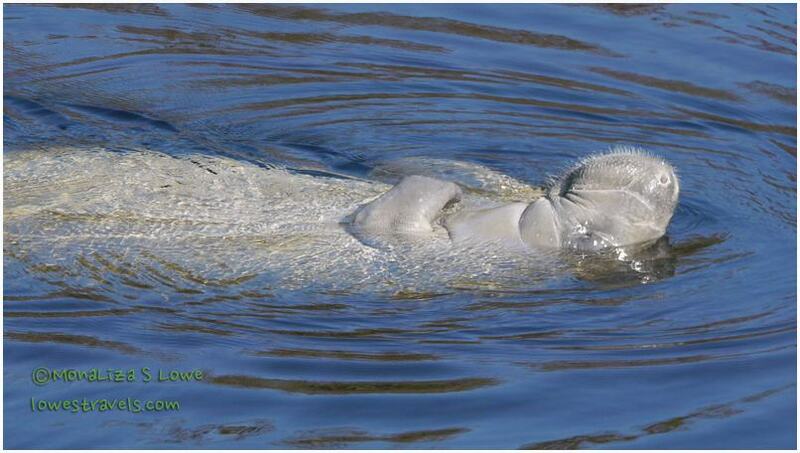 Well, this time we witnessed two manatees actually hugging and obviously enjoying each other’s company – amazing! Click the link below to see a short clip of what we saw (sorry it’s a bit shaky, I was so excited!). Love the moss-y tree. How you fill your mind and heart with lotsa lotsa of great memory and imagery is remarkable, and be grateful for. Beautiful manatees. I’ve not been to Wakulla Springs, must stop there next time I’m in Florida. Following along behind Laurel and Eric, you are sure to find some hidden gems. This looks like a fabulous trip and your video was wonderful. Thanks Linda it was a fun day at the river. The place has a haunting feel due to the spanish moss draping on the bald cypress trees. It is worth a visit there if you like nature and photography. Very cool place to be. We are making a list for when we head to Florida for a winter sometime in the future! Thanks for the great reviews. No camping there but worth a visit. Right, check out Blue Spring. That was a great one too. Wonderful boat tour! Those hooded Mergansers are adorable. I really like the male, looks like he has a helmet on. What an amazing treat to see the manatee in action. Thanks for sharing the video:) I do love that one on its back…so cute! This was a great treat. Super camera work! I wished you and Susan were there to witness it too. Other than that the boat tour was excellent. We have had friends in town for last few days and we were going to take them down to Ft. Myers to kayak with the manatee. Thank goodness I called because the manatee are gone down there:( The gulf is in the 70’s do they have left the power plant. Glad they were still around for your adventure. You sure had a great viewing:) Wish we were there, too! Glad you like it Nancy. We’re so happy that you enjoyed Wakulla Springs and the riverboat cruise. 🙂 And you are definitely a magnet for wildlife!! The red cockaded woodpecker at Ochlockonee State Park, and mating manatee at Wakulla Springs — Wow! Indeed we were very lucky! Thanks for the tip we had a great time with wildlife. 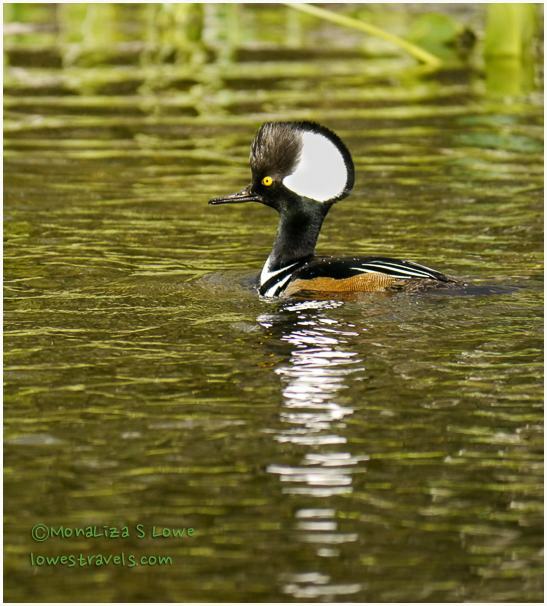 Beautiful photos MonaLiza….love the hooded merganser the hooded merganser. And the manatee are awesome! Thanks Gay, it was a cold but awesome day at the river. We we’re lucky indeed being there at that time, must be mating season. Thanks Carol, out of the hundreds there were a few that turned out good. Hundreds? Well, thank heavens you’re a shutter addict! The first fact is amazing! Great video & pictures! 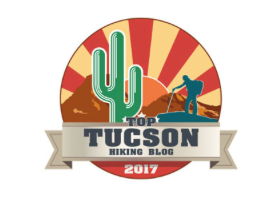 I’m bookmarking this state park. Thanks! 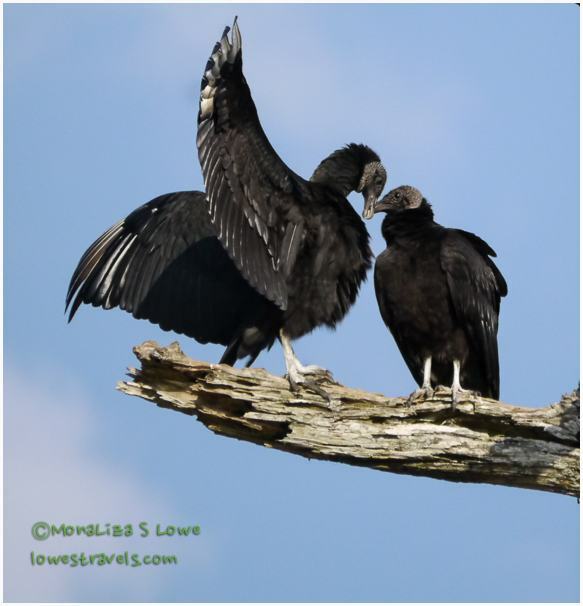 If you like wildlife and a classic Florida river, this is it. 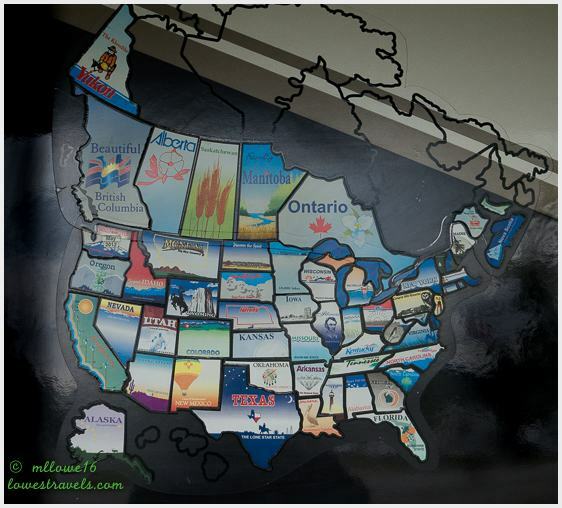 Thanks Ingrid, and so true about sharing travel tales with fellow RVers. Laurel had done that river tour several times, which means it is really a gem and worth visiting over and over again. Amazing pics, indeed! Sounds like a wonderful trip on the river.